The desire to radically challenge capitalism is widespread and growing. 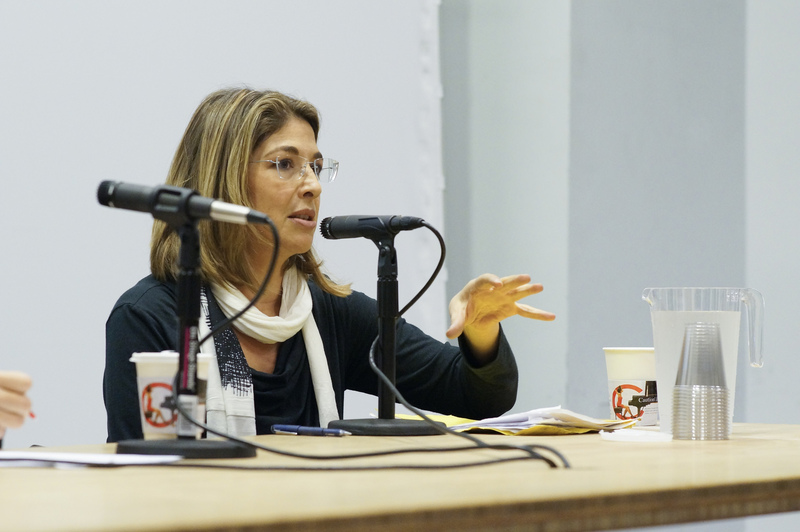 Naomi Klein’s new book is an important contribution to that project. Donald Trump’s speech in Warsaw, Poland, just before this year’s G20 summit, was equal parts pandering and proselytizing, but altogether unsettling. At a moment when cooperation on global warming matters more than ever, the leader of the world’s most powerful country appeared more interested in weaponizing Samuel Huntington than saving the planet. Trump’s position on climate change has set him apart from other world leaders. In her closing remarks, Angela Merkel said she “deplored” the United States’ decision to abandon the Paris climate accords. But for many, polite rebukes have passed their sell-by date. Amid fierce police repression, protests rocked the meeting. Naomi Klein understands this furious cry — “No to the global elite!” “No to empty promises!” “No to the status quo!” — better than most. She’s been traveling the world, writing about struggles for peace and justice for decades. But Klein has a message for these protesters and for the millions more who are horrified by Trump and the landscape of greed, hate, and despair that brought him to power. Some authors are uncannily prolific. You can pull one of their books off the shelf and wonder if you’ve read it already. Naomi Klein is not one of those authors. Each of her books comes after years of careful thought and research — at least until this one. Klein wrote the full-length book, out now with Haymarket Books, in a just few months, suggesting that she has something extremely urgent to say. And she does: Donald Trump’s victory has compounded an already desperate situation of climate degradation. If we — the Left and our progressive-minded allies — don’t get our act together immediately, we’ll be facing not only a climate crisis of nightmarish proportions but also a potentially worldwide conflagration of war and political unrest. Klein’s bases her dire assessment on insights she has gleaned from years of reporting on voracious corporations, slimy politicians, and the social movements that stand up to them. In No Is Not Enough (NINE), Klein draws these experiences together in a multilayered analysis that, for the sake of expediency, we can parse into three nested stories. Neoliberalism, “an extreme form of capitalism,” sits at the center of this disease, Klein argues. Thirty years of untrammeled corporate greed has produced both “the decline of communal institutions and the expansion of corporate brands,” hollowing out our culture and sense of belonging. Materially we’re stuck in a world where the wealthiest 10 percent own nearly 90 percent of all global assets, and we have only a fifty-fifty chance of avoiding a climate catastrophe even if we meet the Paris accord targets. Contrary to the delusions of free-market evangelists, the project and process of neoliberalism didn’t float down from the heavens — it came from the United States, from people like Milton Friedman, whom the White House feted on his ninetieth birthday. This is NINE’s medium-scale story. In truth, nothing has done more to help build our present corporate dystopia than the persistent and systematic pitting of working-class whites against blacks, citizens against migrants, and men against women. The goal is all-out war on the public sphere and the public interest, whether in the form of antipollution regulations or programs for the hungry; substituted in their place will be unfettered power and freedom for corporations. Klein pulls no punches when laying out her fears for the future. “Trump and his ilk are intent on pushing the world backward on every front, all at once.” We were already in the midst of a “social and ecological emergency,” but now we can look forward to “wave after wave of crises and shocks” in the economic, political, and social realms. Lest we forget, these crises and shocks don’t hurt everyone. Military contractors, oil companies, and trough-level cronies profited handsomely from the man-made tragedy of Hurricane Katrina and the ongoing nightmare of the war on terror. Not to put too fine a point on it, but Klein thinks we are hurtling toward “a world that confirms our most catastrophic nightmares.” Mercifully, she yanks us back before we step off the ledge. The Trump administration, far from being the story of one dangerous and outrageous figure, should be understood partly … as a ferocious backlash against the rising power of overlapping social and political movements demanding a more just and safer world. Rather than risk the possibility of further progress (and further lost profits), the gang of predatory lenders, planet-destabilizing polluters, war and “security” profiteers joined forces to take over the government and protect their ill-gotten wealth. The dull compulsion of capitalist life has swallowed up this “imaginative capacity, the ability to envision a world radically different from the present.” Klein thinks the time has come for us to break free and reclaim the utopian tradition. We don’t have a choice: the alternative is too frightening to contemplate. concrete ideas for how to radically bring down emissions while creating huge numbers of unionized jobs and delivering meaningful justice to those who have been abused and excluded under the current extractive economy. Klein envisions it as a model for other communities to take control over the planet’s trajectory. NINE makes numerous important contributions. It expertly weaves together Klein’s insights on topics that range from Hurricane Katrina to Standing Rock, from extraction to direct action. It also breathes fresh life into her earlier work, particularly No Logo. But far and away NINE’s most important insight comes from situating Trump within the broader crisis of neoliberalism. Liberals and progressives — Klein’s primary interlocutors — often acknowledge this fact only to immediately resume obsessing over Trump’s most recent misstep, ignoring the urgent need to push forward a positive vision for change. NINE’s narrative makes it impossible to focus only on the small story of Trump and ignore the big picture of crisis and change. Klein also makes useful arguments directed toward, and about, the more radical left. For example, she rightfully demands that leftists stop playing the “my crisis is more important than your crisis” game when debating strategy and vision. But Klein presents some of her points in a way that feels too one-sided, particularly with regard to Sanders. Sure, he was a flawed candidate, not least for his foreign policy positions, but Klein’s assessment that his inattention to racism and sexism cost him the nomination doesn’t ring true. NINE also stops short of really naming the system — capitalism. Klein talks a lot about neoliberalism and the “corrosive values system” that puts profits before people. This is important, and understandable given NINE’s audience, but it’s worth emphasizing that neoliberalism isn’t capitalism gone wrong — it is capitalism working perfectly. The book’s arguments would have been strengthened by framing the present crisis in a way less focused on the ideas and actors undergirding the neoliberal turn and more focused on how the crises and shocks we’re witnessing stem directly from the relationships inscribed in capitalism. Doing so would also shine a light on how capitalism’s fundamental contradictions have created a ruling class that is much more united than it is divided. That said, in this political moment it’s important to remain mindful of the purpose of NINE, and the role of Klein herself. As a scholar and an activist Klein occupies a fraught middle ground. Her approachable charisma and deep pool of knowledge and experience act as a powerful force, drawing people away from the Right and murky center toward the Left. These qualities are admirable and unsurprisingly spur an impulse from socialists to drag Klein, albeit gently, toward more radical positions on capitalism. This impulse is understandable, but ultimately wrongheaded. Socialists should build on the space Klein has opened up to develop their own vision — a vision that not only dissects global capitalism and the hierarchy of power that buttresses it, but also confronts organizational questions that go beyond figuring out how to share space under the big tent. The Democratic Party — in the face of humiliating defeat and widespread demand for radical change — has proven itself incapable of fighting for anything that challenges the status quo. The Left needs its own vehicle for change. It needs a political party that both represents the needs and demands of working people and challenges the structures that destroy and immiserate working-class lives. The desire to radically challenge capitalism is widespread and growing. Klein’s new book is an important contribution to that project. It’s also a challenge to socialists to take the lead.